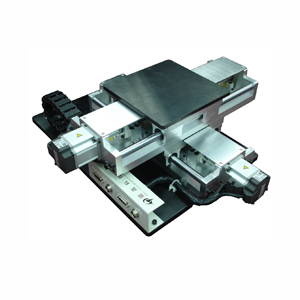 The XY table and linear modules are the basic parts of various CNC and electronic manufacturing equipments. They are also general purpose platform for scientific research, application development and educational experiments. The Googol GXY Series XY tables and Linear Modules, which are tailored made for manufacturers and technical institutes, is based on modularized design and industrial manufacturing standard, and is widely used in various areas of CNC and precision position control equipment research and development such as welding, dispenser, bonding, drilling, packing etc. They are also widely used in universities and colleges for advanced research and teaching in the area of mechantronics, computer control system, mechanical engineering and CNC technology, etc. Open Architecture PC Based DSP motion controller. Open source XY table experiment software. Development of application systems to meet the industry needs. Realize single-axis motor various motion modes control (S-curve, T-curve, speed mode, electrical gear mode) and 2-axis interpolation or synchronized control. Abundant visualization graphical interfaces, display the motion parameter (velocity, acceleration and positon) curves and the simulation and actual motion trajectory of the platform in real time. According to the educational experiments requirement of individual user, the experimental modules can be flexibly configured and thus to facilitates the educational experiments and research works greatly.